The interim boss has been given the manager’s position until the end of next season. TIM SHERWOOD HAS been appointed head coach of Tottenham with a contract to the end of the 2014-2015 season, the Premier League club has announced. 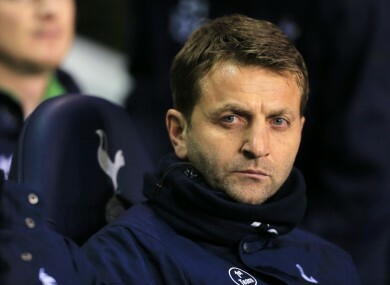 Sherwood had been named as interim coach after Andre Villas-Boas was sacked earlier in December following a 5-0 defeat to Liverpool. The 44-year-old Sherwood had overseen a 3-2 over Southampton on Sunday. “We were extremely reluctant to make a change mid-season, but felt we had to do so in the club’s best interests,” said Spurs chairman Daniel Levy. We have a great squad and we owe them a head coach who will bring out the best in them and allow them to flourish and enjoy a strong, exciting finish to the season. Email “Sherwood handed 18-month contract by Spurs”. Feedback on “Sherwood handed 18-month contract by Spurs”.